The Mayo Clinic presented a paper at the EAST Annual Meeting several years ago that looked at several prediction systems and how they fared in predicting the need for massive transfusion. 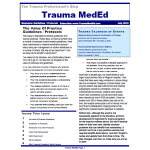 Two of the three systems (TASH – Trauma Associated Severe Hemorrhage, McLaughlin score) are too complicated for practical use. The Assessment of Blood Consumption tool is simple, and it turns out to be quite predictive. In my next post, I’ll look at the impact of using ABC based on prehospital information. Early prediction of massive transfusion in trauma: simple as ABC (assessment of blood consumption)?J Trauma 66(2):346-52, 2009. 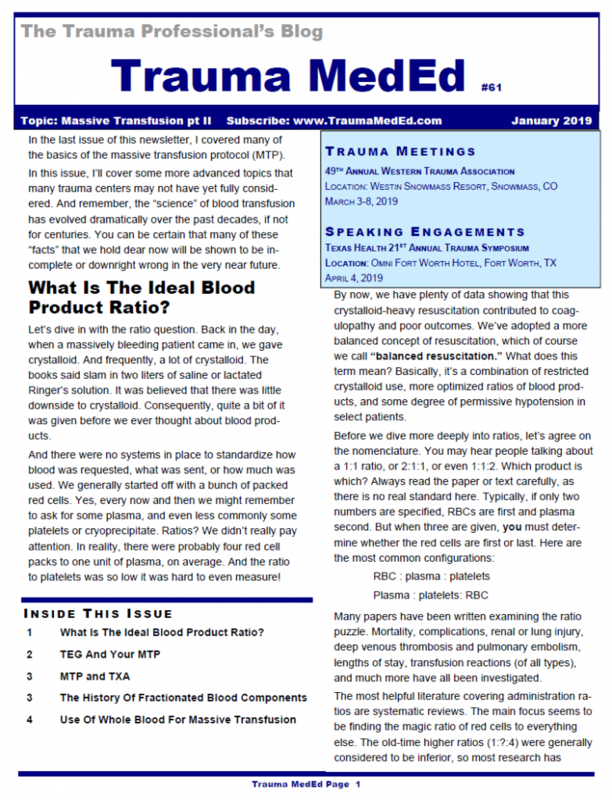 The January 2019 Trauma MedEd Newsletter Is Available! What Is The Ideal Blood Product Ratio? The next issue covers fat embolism syndrome and will be released to subscribers at the end of the month. Non-subscribers will have to wait another week for the public release. To download the current issue, just click here! 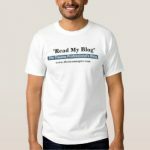 Or copy this link into your browser: http://bit.ly/TME201901. I’ll spend the next few days discussing plasma. This is an important component of any trauma center’s massive transfusion protocol (MTP). Coagulopathy is the enemy of any seriously injured patient, and this product is used to attempt to fix that problem. And now there are two flavors available: liquid plasma and fresh frozen plasma. But there is often confusion when discussing these products, especially when there are really three flavors! Let’s review what they are exactly, how they are similar, and how they differ. This is plasma that is separated from donated whole blood. It is generally frozen within 8 hours, and is called FFP. However, in some cases it may not be frozen for a few more hours (not to exceed 24 hours total) and in that case, is called FP24 or FP. It is functionally identical to FFP. But note that the first “F” is missing. Since it has gone beyond the 8 hour mark, it is no longer considered “fresh.” To be useful in your MTP, it must be thawed, and this takes 20-40 minutes, depending on technique. 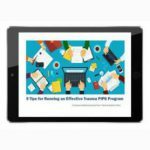 Take a frozen unit of FFP or FP, thaw, and keep it in the refrigerator. Readily available, right? However, the clock begins ticking until this unit expires after 5 days. Many hospital blood banks keep this product available for the massive transfusion protocol, especially if other hospital services are busy enough to use it if it is getting close to expiration. Waste is bad, and expensive! This is prepared by taking the plasma that was separated from the donated blood and putting it in the refrigerator, not the freezer. It’s shelf life is that of the unit of whole blood it was taken from (21 days), plus another 5, for a total of 26 days. This product used to be a rarity, but is becoming more common because of its longer shelf life compared to thawed plasma. Finally, a word on plasma compatibility. ABO compatibility is still a concern, but Rh is not. There are no red cells in the plasma to carry any of the antigens. 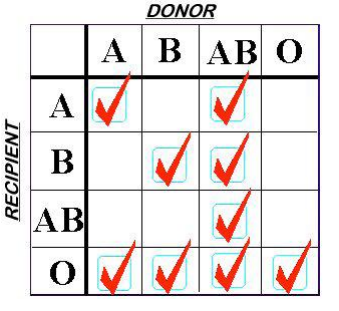 However, plasma is loaded with A and/or B antibodies based on the donor’s blood type. So the compatibility chart is reversed compared to what you are accustomed to when giving red cells. Remember, you are delivering antibodies with plasma and not antigens. So a Type A donor will have only Type B antibodies floating around in their plasma. This makes it incompatible with people with blood types B or AB. Type O red cells are the universal donor type because the cells have no antigens on the surface. Since Type AB donors have both antigens on their red cells, they have no antibodies in their plasma. This makes AB plasma is the universal donor type. Weird, huh? Here’s a compatibility chart for plasma. Next time, I’ll discuss the virtues of the various types of plasma when used for massive transfusion in trauma. EAST 2018 #8: 4-Factor PCC Plus Plasma. What? Many trauma centers have moved toward reversing warfarin with prothrombin complex concentrate (PCC) in place of plasma due to the speed and low volume of infusate with the former. In the US, 3-factor PCC was approved by the FDA first, but it has a lower Factor VII content. This usually required infusion of plasma anyway to make up the Factor VII, so what was the point (although there was some debate on this)? Then 4-factor PCC was approved, and it alone could be used for warfarin reversal. But so far, PCC has not been routinely used for reversal of coagulopathy from trauma. We still rely on plasma infusion for this. The abstract I am discussing today compares reversal with 4-factor PCC alone to reversal with 4-factor PCC and plasma in coagulopathic patients. This study retrospectively reviewed adult patients who received one of the above treatments over a 3 year period. Patient who were on oral anticoagulants were excluded. The goal INR was 1.5, and time to correction and number of PRBC transfused were measured. Bottom line: Well, this is an interesting start. I think this abstract suggests that we should incorporate giving 4-factor PCC into the massive transfusion protocol to try to reduce the INR faster. However, the patient numbers are low and several of the results are only weakly significant (units transfused, mortality, p=0.04). Some additional confirmative studies will be needed before this is ready for prime time! Why did your study group drop from 516 to 120? What impact might this have had on you analyses? Did you look at the correction times stratified by initial INR? Severely coagulopathic patients could skew the numbers, especially if they were predominantly in only one of the study groups. It did not look like the patients received much PRBC or plasma (<10 units of each). How injured / coagulopathic were they? The mortality rates are rather high for an average ISS of 29. Did you analyze to see what impact ISS had on mortality? Could this have influenced your analysis? Big picture question: Should we consider routinely giving PCC as part of the massive transfusion protocol in patients who are known to be coagulopathic? 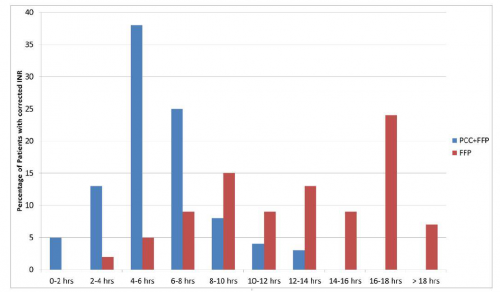 Based on the graph, it looks like patients will need more than a single dose. Reversal time was still very long for PCC+FFP. Thanks for an intriguing abstract! Reference: EAST 2018 Podium paper #12.